Generally, in my life, I have done things that would minimize bodily harm. Learning from an early age that coordination was not my strong suit, my life decisions took a physically safe pattern, except a brief attempt at cliff-jumping in Greece in my teenage years. In my current career in business development and marketing technical services, I talk daily to clients and internal partners about the mechanical, electrical, plumbing and technology design services Mazzetti provides but leave the execution of said work to the professionals. 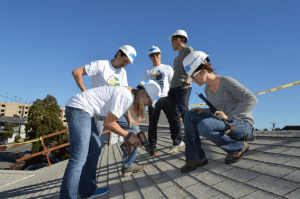 As I think back to last Saturday September 24, I can recall breaking all my self-imposed rules: Being on a tall ladder, working with wire, lifting heavy solar panels up to a team installing a six-panel array on the home’s roof. But, I can honestly say, this was one of the most rewarding activities that I have participated in to-date. 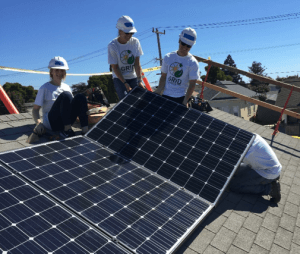 The event was Mazzetti’s sixth solar installation with Grid Alternatives, a local charity, that has a program devoted to installing photovoltaic (PV) arrays on the roofs of low-income homes to offset utility costs for individual homeowners. This particular install was for Emma, a homeowner who had lived in her Richmond, CA neighborhood since the 1980s. Emma, and her posse of three pups, would make an appearance periodically during our six-hour day to stick her head out and see the solar installation progress. A basic safety refresher was provided by the Grid Alternatives staff upon arriving at the site. A large part of this explanation was not walking backward while on the roof and keeping four points of contact while climbing the ladder. We broke into a roof team and a ground team. During this time, the roof team began to measure out the panel spaces, and lay out their dimensions. During this time, the ground team unloaded the six panels from the truck and assisted with (carefully) transporting tools the roof team needed. Grid Alternatives educated us on all of the elements comprised in solar PV systems (solar panel, conduit, wire, and meter). Having flexed our brains, it was then time to flex some muscle to keep up with the roof team. The ground team set out to measure the metal railing that would be installed on the roof and cut at the appropriate dimensions by the roof team. We would send one person up the ladder to pass these railings to the roof team when the final cuts had been made. The ground team then measured each solar panel to ensure that they were converting ample power from energy to power with a reading tool. Having all successful readings from each panel and the foundation work laid for the install, we had earned a lunch break! Back to work! With the roof team busy installing the footing and recently cut rails, the ground team began to lay out where the conduit would lead from the roof to the power supply to create a path for the wire. We had the roof team spot us, provide moral support, while we carefully marked where the conduit would run. In order to fit this path, using a special tool, we had to bend the straight conduit into rough 90 degree angles, which come to find out, is pretty fun! Balanced on ladders and wielding drills, the ground team pulled through, with minimal nails stripped. Onto the finish line: The ground team then began to lift the panels up to to the roof team, which proved to be a two-person task unless you are Cory Yee, who exhibited super strength. 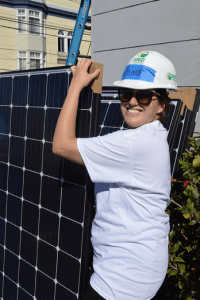 The roof team installed the six panels with ease, and thus started a clean-up process, returning Emma’s home to its natural state, sans power tools. 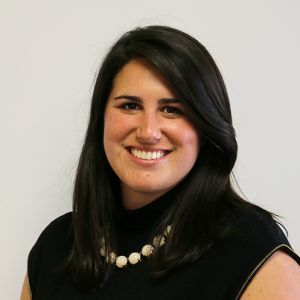 Although activating the employee-installed array would have been icing on the cake, what made it worth it for us was having Emma come out and tell us how happy she was to receive the help from Grid Alternatives. Her smile said it all. Having people on the roof for a substantial time and with a large Grid Alternatives sign placed prominently outside of Emma’s house, the scene peaked interest of a few neighbors. During the install, many members of the community would bike or walk by asking questions about the work we were doing. Many voiced their approval of solar and their interest in getting work done at their homes, surely just minutes from Emma’s house. Having the community so close and interested in cleaner power resonated with us and gave the Grid Alternatives team some ideas for future outreach. Overall, the day was both enlightening and rewarding. I never thought I could say that I helped install a solar panel array. In fact, when I had told friends of this plan, many inquired if a harness would be present. 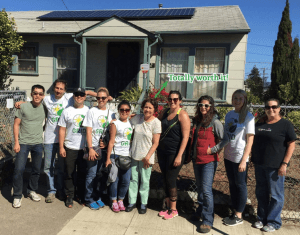 But, I can say that with the accessibility to the project via Mazzetti, and the promise of making someone’s life in the Bay Area a little easier, I was able to get over my hang-ups and be a part of the greater fabric of community goodness.